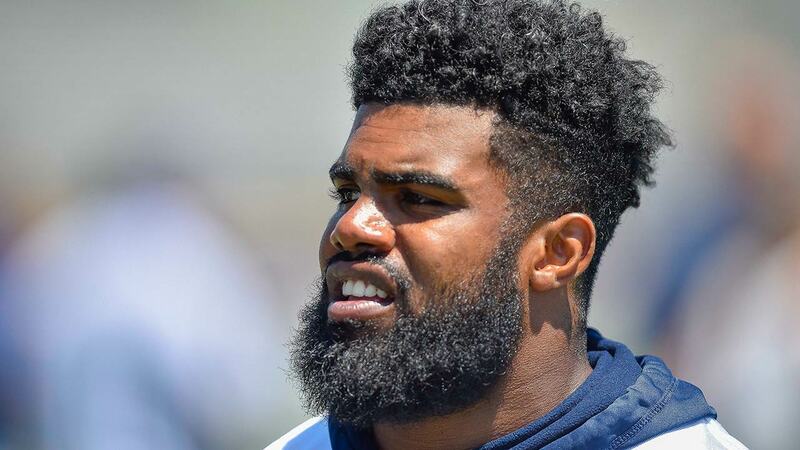 DALLAS -- Dallas Cowboys running back Ezekiel Elliott was suspended for six games Friday after a yearlong NFL investigation of his domestic violence case in Ohio. The 2016 NFL rushing leader was suspended despite prosecutors in Columbus, Ohio, deciding a year ago not to pursue the case involving Elliott's girlfriend at the time in the same city where he starred for Ohio State. The league, however, said there was "substantial and persuasive evidence" that Elliott had physical confrontations last summer with his then-girlfriend, Tiffany Thompson. Elliott will be eligible to return to the active roster on Oct. 23. His first possible game will be Week 8 at Washington. Elliott, who turned 22 last month, has three days to appeal the ruling. One of his agents didn't immediately respond to a request for comment. The NFL Players Association said it was reviewing the decision and had been in touch with Elliott's representatives to consider his options. In a letter to Elliott informing him of the league's decision, NFL special counsel for conduct Todd Jones said advisers brought in by the league "were of the view that there is substantial and persuasive evidence supporting a finding that (Elliott) engaged in physical violence against Ms. Thompson on multiple occasions during the week of July 16, 2016." The NFL's letter to Elliott cited the Ohio case and an incident this past spring when Elliott was caught on video pulling down a woman's shirt while watching a St. Patrick's Day parade in Dallas. The decision came despite Cowboys owner Jerry Jones saying he hadn't seen anything to indicate Elliott was guilty of domestic violence and that he didn't think his star back would be suspended. Jones made the comments several times, including during festivities last weekend when he was inducted into the Pro Football Hall of Fame.